Apple stock gave us the breakout we were looking for. After a 10% rally, what do we do now? Shares of Apple (AAPL - Get Report) continue to press higher, closing higher by another 1.02% to $188.02 on Monday. The name is now up more than 10% from its lows seven trading sessions ago, on Friday, March 8. The move has certainly caught investors' attention, with many eyeing the stock's big breakout up to the 200-day moving average. As a result, it's got many of its observers wondering if now's the time to take profits or if there's more upside to be had. On March 4, just a few days before the big breakout, we highlighted the stock's price action and suggested a large rally could be brewing. $175 was the breakout level while uptrend support (in blue) was slowly trending higher. That support level appeared to give way on Friday after the lower-than-expected jobs report for February knocked the market lower in morning trade. However, U.S. equities rallied from the morning lows, much like Apple did, before triggering a major breakout on Monday. A week later, Apple stock is knocking on the 200-day moving average. Those who trade the stock rather than own Apple stock may want to consider locking in some or all profits now. Six-month daily chart of Apple stock. Jim Cramer won't buy Apple (AAPL - Get Report) at its current price unless the computer giant engages in some radical disruption, like buying medical-device companies, says this story on TheStreet. Apple stock filled the gap near $185 back from November, which was our first target from the pre-breakout play. Now pushing $189, Apple stock is close to testing the 200-day while the RSI, which measures oversold and overbought conditions, suggests the latter is in play. For those that prefer to stop-out on a trade in order to "let the winners run," certainly consider trailing up stop-loss orders on this one to ensure a profitable trade. It would not be bearish to see Apple stock consolidate under the 200-day moving average for a few sessions and/or pullback to the 20-day moving average. This will allow Apple stock to unwind some of that overbought condition and give bulls the rest they need before pushing Apple higher once again. 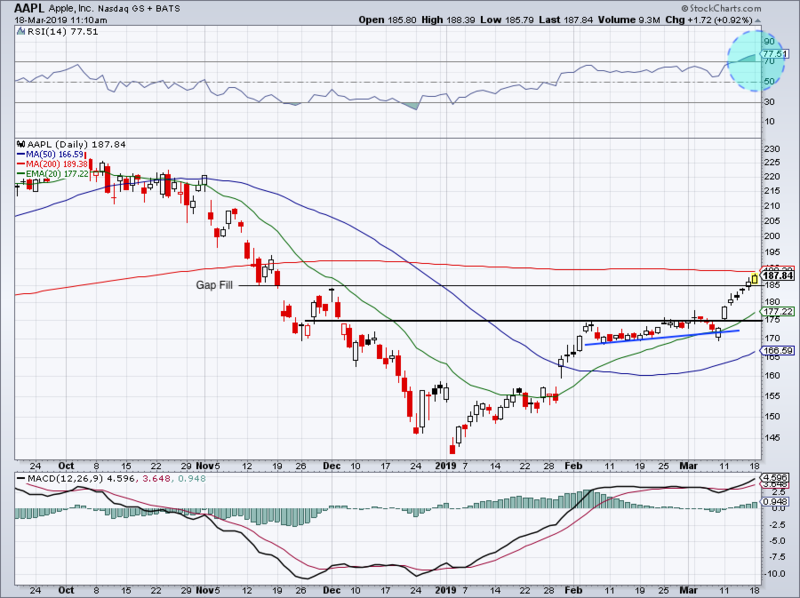 Apple stock doesn't become too concerning on the downside unless it falls below $175.